This weekend will have a couple of familiar faces for long time Laker fans. Former LSSU bench boss Scott Borek (LSSU record of 76-94-15 between 1996-2001) is now the head coach of the Merrimack Warriors, after spending some time as an assistant at the University of New Hampshire (2002-2015) & most recently with Providence (2015-2018). Joining him on the bench is recent LSSU grad and defenseman Matt McArdle. McArdle while with the Lakers played in 83 games and tallied a total of 10 points. He was able to transfer as a graduate at the end of last season, and it appears he moved back east, though I’d like to believe he just got a bit confused since both the Warriors and Lakers wear the same colored uniforms. The Warriors lost their top 3 point scorers last season, but looks like they, like the Lakers, return all three of their goaltenders. There isn’t much else to be said about this team, with it being the first weekend of the season, but they do have a Winnipeg draft pick on their team in Johnathan Kovacevic (74th overall, 2017), but they were picked to be dead last in the Hockey East. After a four year contract extension this past summer, head coach Damon Whitten is back for his fifth year behind the Laker’s bench. He is joined again by long time NHLer Mike York and newly hired Zack Cisek. The trio have a few things in common: They are all from down state & are graduates of Michigan State. This has nothing to do with the series, but it is a ‘fun’ fact. I’m going to opt to link to our season preview here rather than talk about who the Lakers are returning and such (remember, work smart, not hard). Now, while the Lakers were not listed as last in the WCHA in either the coach’s or media polls (that honor went to Alaska-Anchorage), there are many that think the Lakers will again miss playoffs this year, so both of these teams have that in common. This weekend’s series will be a good indicator as to what we may expect to see for the rest of the season. But it is important to remember that it’s also a 15 hour bus ride for our boys in blue. This is also the first time since playing Vermont in the Catamount Cup in 2015-2016 that the Lakers have seen a Hockey East team, and the first series since Notre Dame in 2014-2015. For you Laker fans out east, the games will be held at the J. Thom Lawler Rink in North Andover, MA at 7pm Saturday and 4pm Sunday. For those who cannot go to the game, like most of us, YesFM will be streaming the games at http://www.yesfm.net, though I am not sure if it will be the Merrimack feed or if the great Bill Crawford is making the journey. In order to stream the game, you will need to purchase a 24 hour pass from https://merrimackathletics.com/watch/, which will cost $6.95. It also appears that Merrimack is offering the audio for this weekend’s series for free if there are any issues with the YesFM stream. 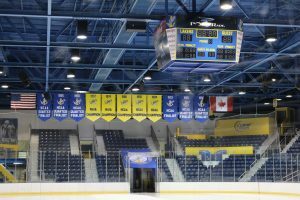 ©2017 LakerHockeyBlog.com This site is not affiliated with Lake Superior State University, and the views expressed on this site are solely those of the authors.